Anna tried this dish and said, "I don't know what you did to this chicken, but it's really good." Noted, and will definitely make this again! This chicken is baked, but it really does have the crispiness of fried chicken. This is actually the third time I've made this recipe, but it was slightly different each time, depending on what I had on hand. 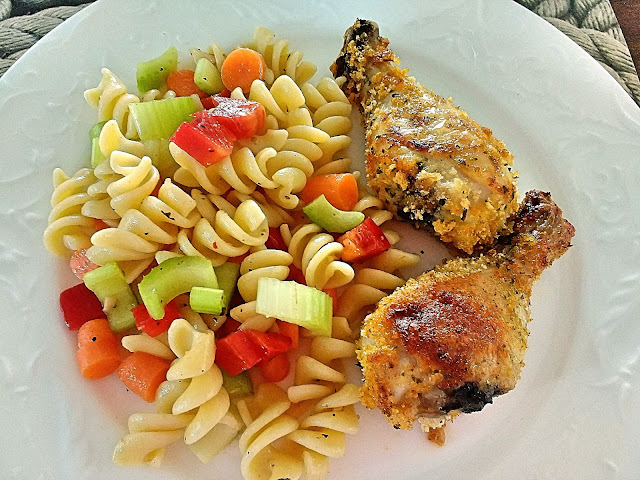 The first time, I made it with regular breadcrumbs; the second, I used regular paprika. Clearly the winner was panko breadcrumbs and smoked paprika. I mostly just tossed spices in and didn't measure, so I'm estimating on this a bit. Preheat oven to 400 degrees F (convection bake). Line a baking sheet with aluminum foil, and spray with canola oil spray. Mix Corn Flakes, panko breadcrumbs, spices and herbs in a medium sized bowl. Roll drumsticks in breading mixture to fully coat. Place on baking sheet evenly spaced. Bake for 25 minutes, then remove from oven to turn chicken drumsticks over quickly. Place baking sheet back in oven for 15 more minutes, until coating is crispy and browned.